The story and history of Saint Philogonius. Saint Philogonius was educated for the law, and appeared at the bar with great success. He was admired for his eloquence, but still more for his integrity and the sanctity of his life. This was considered a sufficient motive for dispensing with the canons, which require some time spent among the clergy before a person be advanced to the highest station in the Church. Philogonius was placed in the see of Antioch, upon the death of Vitalis in 318. 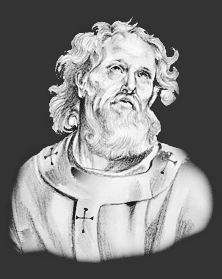 When Arius broached his blasphemies at Alexandria in 318, St. Alexander condemned him, and sent the sentence in a synodal letter to St. Philogonius, who strenuously defended the Catholic faith before the assembly of the Council of Nice. In the storms which were raised -against the Church, first by Maximin II. and afterward by Licinius, St. Philogonius deserved the title of Confessor; he died in the year 322, the fifth of his episcopal dignity. The Feast Day of Saint Philogonius is December 20. The origin of Feast Days: most saints have specially designated feast days and are associated with a specific day of the year and these are referred to as the saint's feast day. The feast days first arose from the very early Christian custom of the annual commemoration of martyrs on the dates of their deaths at the same time celebrating their birth into heaven.